Recently I've been doing some ActionScript programming. Rather than target a Flash Player app. I've been using ActionScript in combination with Adobe AIR in order to create an iOS app. This has meant I've been spending time in OS X and using IntelliJ with the the ActionScript/Flex/AIR plugin as my IDE. Most of my previous work has been done on UNIX (so command lines & vi) and Windows. In particular I depend on the various Windows & Visual Studio editor key combinations plus the Insert, Delete, Home & End keys. For starters this means I use a PC keyboard with the iMac rather than the Apple keyboard as it lacks these keys; I'm also based in the UK so I use a British PC keyboard. In addition to these keys I wanted the following combos to be available across all of OS X and any apps. Alt-Tab to cycle through apps. Ctrl-S for save current document (I habitually press this whilst editing). Ctrl-C & Ctrl-V for copy & paste. Obtain the correct behaviour for the '\|' key and the '`¬' key. They were swapped initially. '@' & '"' correctly mapped. Plus their selected text equivalents. Ctrl-Home/Ctrl-End to move to the top/bottom of the document being edited. 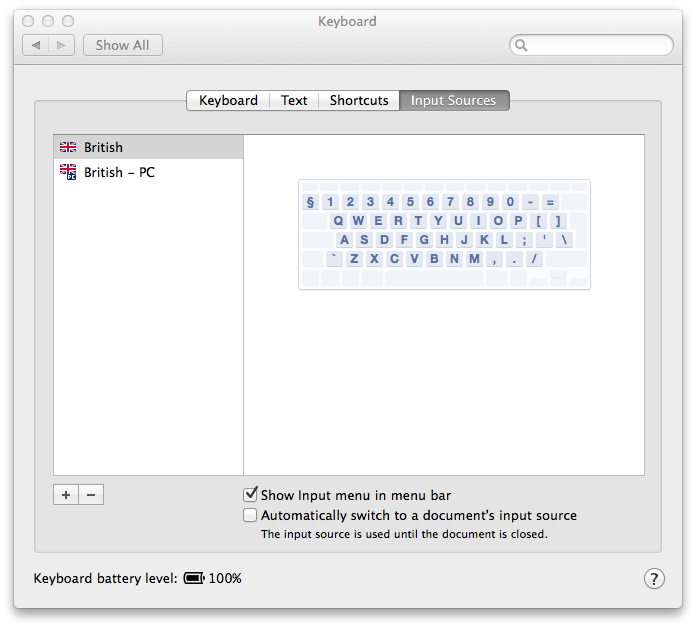 The first step was to tell OS X I was using a PC keyboard, specifically a British one. This is achieved through the System Preferences->Keyboard->Input Sources. Here new input sources can be added by clicking the '+'. I added 'British - PC'. Adding doesn't mean it will be used though. For this also check the 'Show Input menu in menu bar' option. This adds a country flag and the name of the input source. Clicking on this allows the input source to be changed. If you swap between a PC keyboard and the iMac keyboard (which I do from time to time) this is an easy way to swap. What all this gives you is the '"' and '@' keys in the right place. Otherwise they're transposed. Note: backslash and backquote remain transposed. The second step was obtaining the Windows' key combos. This requires mapping the Windows' combos to the corresponding OS X combos whilst preventing the Windows' combos being interpreted as something else. After some searching it seemed like the preferred solution to this is using a 3rd party program called KeyRemap4MacBook. According to various reviews it does the job well but configuring it, especially creating your own mappings is complicated. The former being down to the UI and the latter to the XML format. All these things are true but once you've got used to it, like a lot of things it's nowhere near as daunting as it first seems; and the document is very good too. Part of the motivation for this post is to record the configuration & steps for my benefit should I need to do it again. KeyRemap4MacBook comes with a number of canned mappings. In addition to mapping across the board they can be limited to include or exclude a specific set of apps. In particular I make use of a set of pre-defined mappings from the 'For PC Users' section which won't be applied in VMs (generally running Windows, especially useful when running Windows 8 in Parallels from the Bootcamp partition) and terminals. As I still use the Apply keyboard from time to time when I want to do very Apple-ly stuff I have the 'Don't remap Apple's keyboards' option enabled. Without doing very little work this meets the majority of my needs. In addition to the 'For PC Users' and 'General' section you may also notice the three re-mappings at the start. These are custom mappings I had to create. I'm not going to explain the XML format as this is available from the documentation. Instead, here are my custom mappings. I didn't want these mappings other than swapping backslash and backquote to be applied in various apps. i.e. VMs, VNC & RDC (where Windows is running anyway) and Terminal where it interferes with bash. To enable this I used the <not> element giving a list of excluded apps. along with using the appendix element to state this in the description. Rather than copy the list of apps. and description I used KeyRemap4MacBook's replacement macro feature. There is a list of builtin apps. that can be referred too but I also looked at the XML file from the source that contains the 'For PC Users' mapping. The _L & _R refer to keys which appear twice: on the left & right side of the keyboard. The format allows multiple mappings to be grouped. These don't have to be similar but this the intention, i.e. all the ctrl-home/end mappings are together. Each <autogen> entry is a separate mapping but they are enabled/disabled collectively. The format isn't too bad. The weird thing from an XML perspective is the <autogen> element. This is source combo followed by combo to generate instead separated by a comma. I think it would be easier to understand if this element were broken down into child elements with say <to> and <from> elements. This private.xml is also available as a GIST. IntelliJ complicates things slightly as it provides its own key-mapping functionality similar to that of KeyRemap4MacBook but solely for itself. 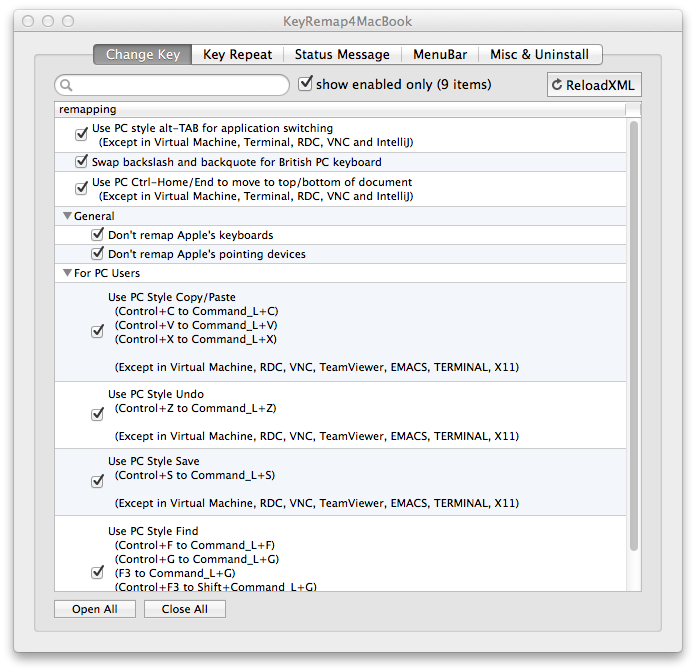 This means that there can be a conflict with KeyRemap4MacBook. I'm writing this a while after I originally implemented it. In fact part of the reason I'm writing this post at all is so I have a record of what's required. Since getting this working it looks like I've changed my IntelliJ Keymap (from Preferences). Originally it was set to 'Mac OS X' but is now set to 'Default'. Change 'Move Caret to Next Word' from 'alt ->' to 'ctrl->'. Change 'Move Caret to Previous Word' from 'alt <-' to 'ctrl <-'. Change 'Move Caret to Next Word with Selection' from 'alt shift ->' to 'ctrl shift ->'. Change 'Move Caret to Previous Word with Selection' from 'alt shift <-' to 'ctrl shift <-'. Change 'Move Caret to Text End' from 'cmd end' to 'ctrl end'. Change 'Move Caret to Text Start' from 'cmd home' to 'ctrl home'. However, it seems that the 'Default' key mappings are as per-Windows but when KeyRemap4MacBook is running they all conflict. In fact I may have missed this completely when initially figuring this out. Therefore the far easier solution is to select the 'Default' IntelliJ mapping and using KeyRemap4MacBook make it aware of IntelliJ and exclude it from key re-mapping as per the other applications. This is the purpose of the appdef section in private.xml. 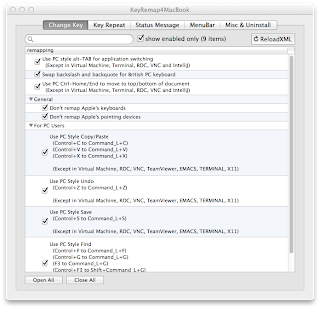 KeyRemap4MacBook doesn't need definitions for other excluded apps. as these are built-in. The mappings are not perfect. IntelliJ is great but this is now down to IntelliJ's mapping and having excluded it from KeyRemap4MacBook mapping. I still miss Ctrl-Left/Right-Arrow and Ctrl-Home/End in other apps. but hopefully this should just be a case of defining more mappings and the Ctrl-Z (undo) mapping effectiveness seems to vary.